Shawn & Kay Hesketh were honored for a decade of service to the high school art community of Houston during the 9th Annual Culture Shapers Visual Arts Awards Ceremony on Thursday, November 20th, 2008. Ernie Fitzpatrick, co-founder of the art contest, along with his wife, Lyn, presented the award to the Heskeths in front of a live audience, as he credited Shawn with the original idea for the Culture Shapers art contest as the result of a series of brainstorming meetings in 1999. I’ve been making an effort to listen in on my kids more during their independent play times recently. I’ve been truly amazed to hear them interact with each other in all sorts of pretend roles. They’re pirates, or puppies, or a family (and sometimes gender doesn’t dictate who’s the mommy or daddy, too!). I have to say that I’ve loved ‘eavesdropping’ on their creative play. It’s truly amazing to me what kids will do and think of and act out if just given a little time and space. And while I know that I’m a much different mom than some, I kind of like that my kids can play really well without me – even at such young ages. But, I’m also noticing that when I do interact in that time (and even get a little silly myself), I somehow wind up scoring HUGE points in their emotional banks. So, I’m trying to learn how to do both well. Just found out about Amazon’s 4-Day Super Sales and it looks like there’s going to be some amazing deals throughout the month of November, much less on Black Friday. Save 10% on Britax car seats and strollers sold by Amazon.com for one week only, starting 11/17-11/23. Purchase $139 of select Philips Avent products sold by Amazon.com and receive a $40 Amazon gift certificate. Be sure to check out the dates on all the promotions as each of them has different set of days that they are valid. Since we go to the library on an almost weekly basis and have probably checked out hundreds of books at this point, I thought it would be fun to start a category of small posts about the books we’ve enjoyed the most. So, here’s your first glimpse at one of our favorite books of late. I hope you enjoy and also share with us some of your favorites, too! The Princess and the Pea has long been a favorite fairy tale of mine, so when I saw this title, I just had to check it out. 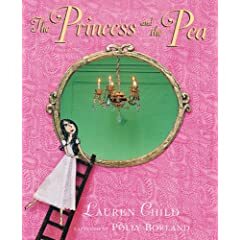 When we got home to read it, I realized that, while based on Hans Christian Anderson’s original tale, it was a version written and illustrated by Lauren Child, the author and illustrator of Charlie and Lola, a book series and one of our favorite cartoons on the Disney Channel.